Caroline Cho was born and raised in the captivating city of Sao Paulo into a family filled with a rich Korean heritage. The city itself was also a blend of cultures. This vibrant mixing pot created a love of art and beauty that she now brings to the world of fashion. Cho's mantra, "Fashion design is the chance we have to create garments like the wild flowers, with all the colours of the wind and the limits of the universe." As a child this future designer loved to play sports, but by high school those interests changed. "Art class was almost like a break to me. Painting, sculpture and drawing were relaxing and enjoyable. I was also intrigued with the complexity of biology studies and math came easy." Her 'Breakfast at Tiffanys' side won out and drew her increasingly into the glamorous world of fashion. She began to collect magazine advertising cutouts and used them to cover her wardrobe doors. Initially this interest led to studying Communications and Marketing and from there to a job working for another clothing brand - Princess. It wasn't enough. She wanted the entire package from beginning to colour theory to textile fundamentals. It was time to head back to school. Milan and London were the first choice for fashion studies. However, these programs weren't exactly what she was looking for. Eventually her eyes turned to Canada, but ultimately it wasn't fashion that brought her to Vancouver. It was love. On a cruise with her parents, she met her future husband. Only a brief 4 months later she found herself stepping off a plane at YVR and enrolled in the fashion design program at The Art Institute of Vancouver. There were no regrets. "This was definitely meant to be. The Art Institute of Vancouver was just part of a divine plan. It was exactly what I was looking for and proved to be the right choice." Cho was now in school in a different country, studying in a different language and completely away from family and friends. She remembers, "It was a daily task to absorb more vocabulary, but aside from the language I was doing what I loved. I was always bugging my teacher to teach me everything and had constant questions on how to do it flawlessly." Always looking for a challenge, the budding designer entered the school's Cool vs Cruel Competition. Then came the national Telio Breakthrough Designer Competition where she was one of 25 finalists. The theme - Light with an Over Exposed Glow. Every finalist had their design shown on the runway at Montreal Fashion Week - something Cho will always remember. "It was an unforgettable experience and I am forever thankful to Telio for the opportunity. 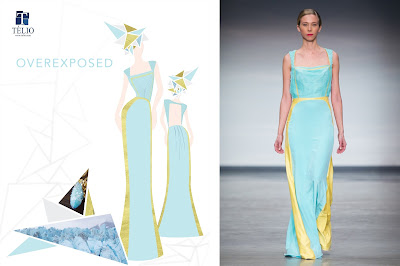 The most exciting moment is when you see the dress you designed and sewed so passionately in a real-deal runway show. The heart skips a few beats and you can't breath, but it doesn't matter." Telio Competition illustration and final garment. On return from Montreal, Cho began the intimidating task of producing a graduation portfolio and 3 final looks. The idea of creating a wedding collection blossomed from her personal journey. Hours of research were spent collecting ideas and inspiration, in fact a whopping 30 ideas provided the starting point. Avoided were the traditional strapless mermaid silhouettes and designs had to flatter a wide range of body types. 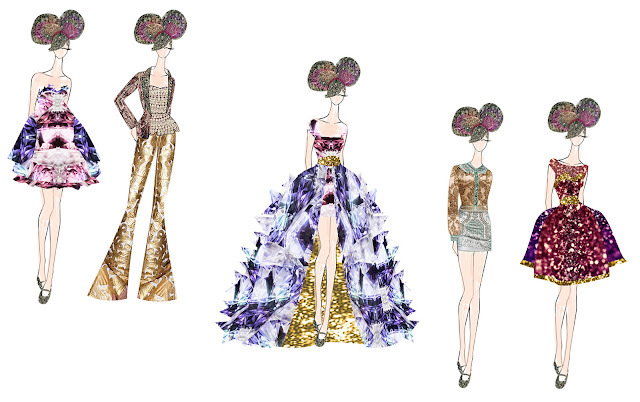 "My final concept was a mixture of vintage with a Bohemian Chic - like a wedding happening in a secret royal garden. The colour story was dry mint and blush pink for the bridesmaids and an antique white for the bride. I paid special attention to the laces I chose because they are important element in creating a stunning effect." The lace was paired with silk charmeuse and iridescent chiffon to create a finer and more delicate look. With graduation now behind her, Cho is focused on gaining more experience with existing brands and expanding her knowledge in all areas of the design process - concept development, designing, pattern making, communication, marketing and branding. And she is grateful for her time at The Art Institute of Vancouver. "Beyond the knowledge and skills, I am glad for the people I met and worked with - not only my friends, but instructors and advisors Brenda Wong, Anita Heiberg, Shainin Karnai and Sandra Scott. It means so much to have you on my side." To contact Caroline Cho please visit her website at http://camellows.wix.com/caroline-cho. For more information on the Fashion Design and Fashion Marketing programs at The Art Institute of Vancouver go to http://www.artinstitutes.edu/vancouver/.